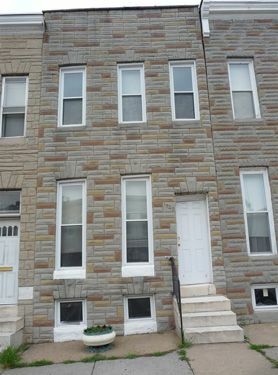 1928 Riggs Avenue is located in west Baltimore in a neighborhood called Bridgeview - Greenlawn. The area is made up of two and three story townhomes, with some businesses nearby. Downtown Baltimore is approximately 2.5 miles to the east, and I-95 is approximately 1 mile to the south. The lot fronts 14' on Riggs Avenue, with depths of 80'. Two story brick townhome contains a living room, dining room and eat-in kitchen with walk out to rear yard, on the first floor; three bedrooms and bath, on the second floor; basement; gas forced air heat. The home formerly received an MDE lead reduction certificate. New roof coating and skylights (2008). The property formerly rented for $750/month, and is currently vacant. The property is sold free and clear of all liens and encumbrances, subject to an $84 annual ground rent. The property will be available for inspection from 12:10 p.m. on the day of sale only. No prior inspection is scheduled. Check back to this page in the event alternate arrangements are made. A $2,500 deposit, payable by certified check or cashier's check, will be required of the purchaser at time and place of sale. The deposit shall be increased to 10% of the purchase price within 24 hours at the Auctioneer's office. Balance to be paid in cash within 45 days. If payment of the balance does not take place within the specified time, the deposit shall be forfeited and the property may be resold at the risk and expense of the purchaser. Interest to be charged on the unpaid purchase money, at the rate of 12% per annum, from date of sale to date of settlement. All adjustments, including taxes, ground rent, all other public charges and assessments payable on an annual basis, and sanitary and/or metropolitan district charges, if any, to be adjusted for the current year to date of sale and assumed thereafter by the purchaser. The property will be sold in "AS IS" condition, and subject to easements, agreements, restrictions or covenants of record affecting same, if any. Purchaser assumes the risk of loss from the date of sale forward. The purchaser agrees to waive the right of inspection for lead paint, as provided under current Federal and State law. If the Seller is unable to convey good and marketable title, the purchaser's sole remedy in law or equity shall be limited to the refund of the deposit. Upon refund of the deposit this sale shall be null and void and of no effect, and the purchaser shall have no further claim against the Seller or Auctioneers. Recordation costs, transfer taxes and all costs incidental to settlement to be paid by the purchaser except where otherwise mandated by local, State or Federal law. Time is of the essence.